Once again, the long battle for control of Sanctuary is over and the tyrant Lut has been imprisoned. Now that the dust has settled, the people demand justice. The perpetrator of all our suffering shall be brought before the people for judgement and the origins of the city of Sanctuary shall be revealed. Long ago Lut, the Sultan of Sanctuary, made a deal that that tore the realm from God’s judgment. This deal Lut has never had to answer for until now. The dark Sultan will be placed before judgment for this deal he made. Will he be found innocent and justified, or guilty and be destroyed because of it? Did Lut act in the best interest of the people in order to save their humanity and his own, or did his rebellion against the wishes of God serve his own dark and twisted purpose? The city’s dark secrets shall be shown for all to see and sad tales shall be told, but one thing is for certain, Sanctuary will never be the same again! If you’ve missed any parts of our roleplay, you can find them in a clickable book called “The Origins Of Sanctuary: Lut’s Story”, sitting outside of the Throne Room and Court Room areas on the Spires of Andolys! 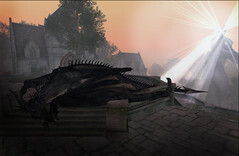 Sanctuary will be based in Spires of Andolys. Read more about the origins of Sanctuary. Keep up to date with the developing story here.